I recently went on a short vacation, driving down Highway 401 and Interstate 75 from Toronto to Florida’s Gulf Coast. From there, I went on to Miami and Miami Beach, before flying back north; first to New York, then back home to Toronto. On the drive down, I took the opportunity to visit some of the cities along the way. Once I crossed the border and entered Detroit, my route followed Interstate 75 all the way. The great highway, 2,875 kilometres (1,786 miles) long, goes from the Canadian border at Sault Ste. Marie south to Naples, Florida, and via Alligator Alley to just north of Florida on the Atlantic Coast. Interstate 75 passes through Detroit, Cincinnati, Knoxville, Chattanooga, Atlanta, and Tampa; all were stops along the way. Four of those cities — Detroit, Cincinnati, Atlanta, and Tampa, all are either building, or have completed, new streetcar lines. Tampa’s TECO Line is a vintage heritage streetcar (like those in New Orleans and Memphis), the other three are modern streetcar lines that are, or will be, similar to those in Portland and Seattle — short urban circulator routes. Nearly all streetcar routes built in the last decade have followed Portland’s model of a modern circulatory streetcar; older systems, such as Tampa’s (or those in Memphis and newer lines in New Orleans) are heritage-type streetcars, using vintage or replica equipment on lines that are part of the regular transit system, but geared more to tourists and occasional riders. Unlike light rail, (think Calgary’s C-Train, or Los Angeles’ Gold, Blue, Green, or Expo Lines), the new streetcar systems being built in the United States have short stop spacing, usually run in mixed traffic (or in separate lanes on city streets), and are often built to promote urban development, tourism and/or local transit ridership. The systems planned or being built here in Ontario, such as Ottawa’s Confederation Line, or Kitchener-Waterloo’s ION line, should be considered as light rail (though ION will be partially running in city streets in Uptown Waterloo and Downtown Kitchener). After crossing the border, I made a quick stop in Detroit to see the progress on the M-1 Rail streetcar. 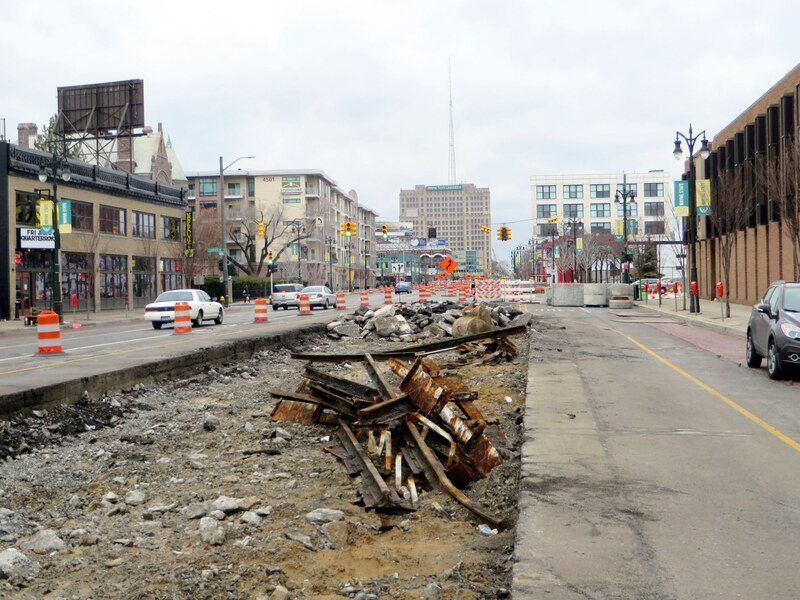 Near Wayne State University, the roadway was being rebuilt to accommodate the new tracks; crews had dug-up the old streetcar tracks last used in 1956. Detroit once had a very extensive streetcar system that was one of the first to be publicly owned (Detroit and Toronto were pioneers in this respect); Detroit’s Department of Street Railways (DSR) even had a fleet of modern PCC streetcars in the post-war era. But the Motor City opted for buses, and it, with state and federal financing, was busy building a network of freeways to serve that rapidly decentralizing urban area. The M-1 streetcar is scheduled to open in 2016; 60 years after the last Woodward streetcar pulled into the carhouse in Highland Park for the last time. 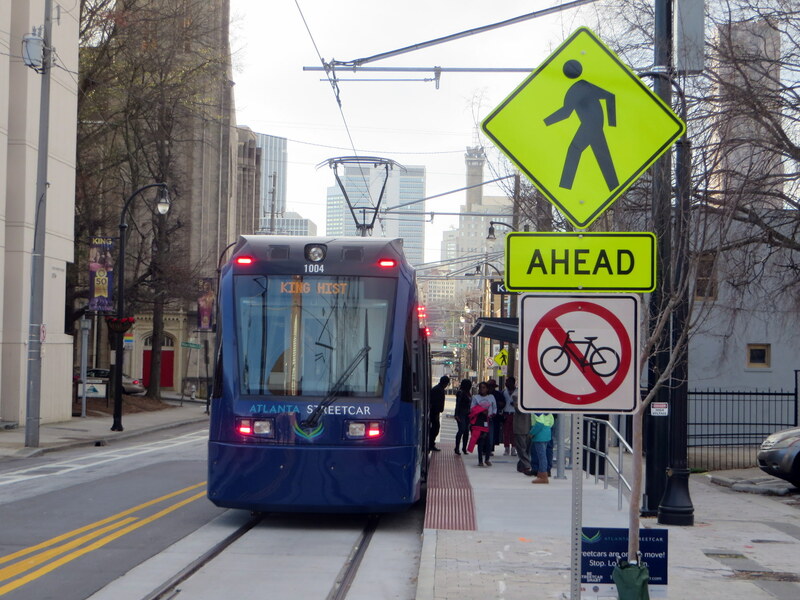 The route will mostly operate in curb lanes, much like other modern streetcar routes in Portland, Seattle, and the new Atlanta Streetcar discussed below. Interestingly, only the central section will have overhead wires; downtown and in New Center, the streetcars will operate off of battery power. In a city emerging from bankruptcy, Detroit’s short streetcar is being built mostly with private money; downtown business interests and some public institutions, such as Wayne State University, are contributing most of the funds. These business interests include the owner of the Detroit Red Wings and Tigers, pizza magnate Mike Illitch. Illitch’s firm, Olympia Developments, is looking to build a new arena for the Red Wings right on the streetcar line. Dan Gilbert, the head of Quicken Loans, centralized his company’s offices downtown and is one of the line’s biggest backers. Certainly the line will be an improvement and spur more development along Detroit’s most famous avenue; it will connect most of Detroit’s major trip generators. But the rest of the city is sprawling, largely poor and blighted,; the public transit system, D-DOT, has been forced to make major cutbacks in the last few years. The city and federal governments preferred to build a bus rapid transit system that would serve suburban commuters as well as city residents; this is the main reason private funds are being used for this project. 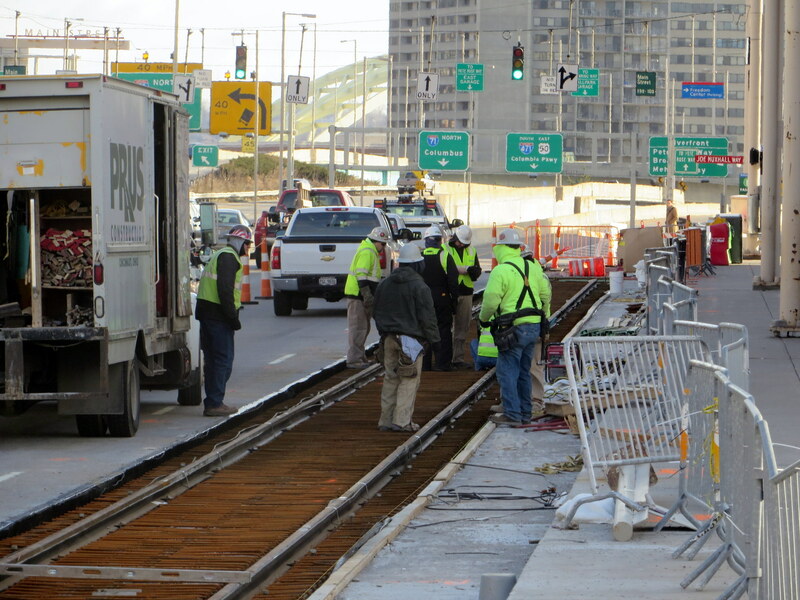 The Cincinnati Streetcar, also planned to open in 2016, is further ahead in construction than Detroit. Like Detroit’s line, it was planned to link the downtown core with sports and entertainment venues, educational institutions, and gentrifying neighbourhoods. However the line, first proposed in 2007, has been mired in controversy. An unlikely alliance, conservatives and the NAACP, opposed the streetcar plan for different reasons and backed ballot initiatives to block the project. Republicans at the state level pulled funding for the project and opposed it at the federal level. (To put it very simply, conservatives were opposed to money spent on the project, while the NAACP saw the streetcar, serving the downtown and the gentrifying Over-the-Rhine district, distracting from social needs elsewhere in the city.) Until a pro-streetcar council was elected, it seemed that Cincinnati was yet again going to see a rail transit project abandoned before completion. After World War I, plans were drawn up for a new streetcar subway line through an abandoned canal bed on the north side of the downtown core, with a new parkway built on top (Newark and Rochester also built streetcar subways in disused canal beds; Rochester’s was abandoned in the 1950s, Newark’s City Subway is still in use as part of its light rail system.) Central Parkway was built; the subway underneath was partially completed, and when the costs to complete the line soared, and construction bonds ran out, work was abandoned. The Cincinnati Street Railway completely got rid of its streetcars in 1951. Interestingly, many of Cincinnati’s streetcars continue in service here in Toronto. The purchase of 52 PCC streetcars was the first of several streetcar acquisitions the TTC made from American cities abandoning their street railways in the 1950s. 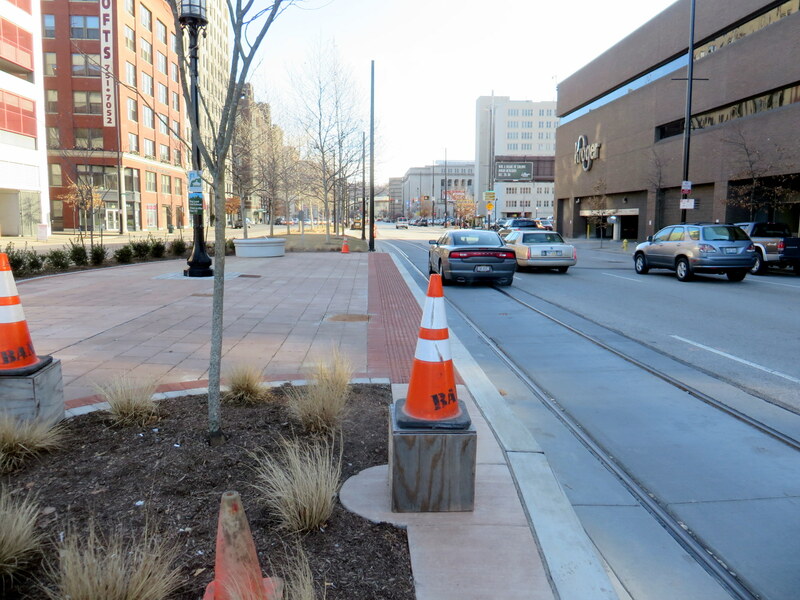 While in that city (which I’d like to explore further; I was only there overnight and in the morning), I got to see new streetcar rail be laid along the route, and poles put up for overhead wiring. But without the extension to the University of Cincinnati, and a route catering more to tourists and to downtown and Over-the-Rhine residents and bar-goers, I wonder about the utility of this one short loop. The Atlanta Streetcar opened on December 30, 2014, so I got to ride it a week after its launch. The new line, intended as the first phase of a larger system, connects downtown with the near east side, an area known as the “Old Fourth Ward” which includes the Dr. Martin Luther King Historical Site (where the civil rights leader was born, grew up and preached at his community church). The route, a one-way loop, similar to Cincinnati’s project, is only 3.7 kilometres long (2.3 miles); streetcars currently run every 10-15 minutes. For the first three months, the streetcar is free. Atlanta ripped out its streetcar system in the 1930s and after the Second World War; the last streetcar operated in the Georgia capital in 1949. The route serves many of Atlanta’s tourist attractions, including the King Historic Site, the Centennial Olympic Park, the World of Coca-Cola and the Georgia Aquarium (Atlanta, being land-locked, hundreds of miles from the Ocean and not even on a river, is an odd place for an aquarium, but I digress) and connects with Atlanta’s rapid transit system, the MARTA subway. But the streetcar’s short route, and infrequent schedule work against it. I found it to be very slow, and with a frequency of only every 10-15 minutes, it isn’t an efficient way of getting around the downtown core. If you miss it, you’re better off walking. The Atlanta Streetcar in mixed traffic. Note that cyclists are banned from the streetcar’s route. Tampa’s streetcar, opened in 2002, connects Tampa’s downtown with the historic Ybor City neighbourhood via a route along the city’s waterfront. While Tampa’s downtown is an important regional financial centre, it is rather dull, even sterile. Ybor City has emerged as the city’s nightlife and entertainment district. It has a bit of the same architectural charm one finds in the French Quarter in New Orleans. Like most early streetcar projects in the modern era, the TECO Line (named for Tampa Electric, the electric utility that helped sponsor its construction and operating partner) is a vintage streetcar system, using replica “Birney” streetcars built by the Gomaco Trolley Company in 2000. 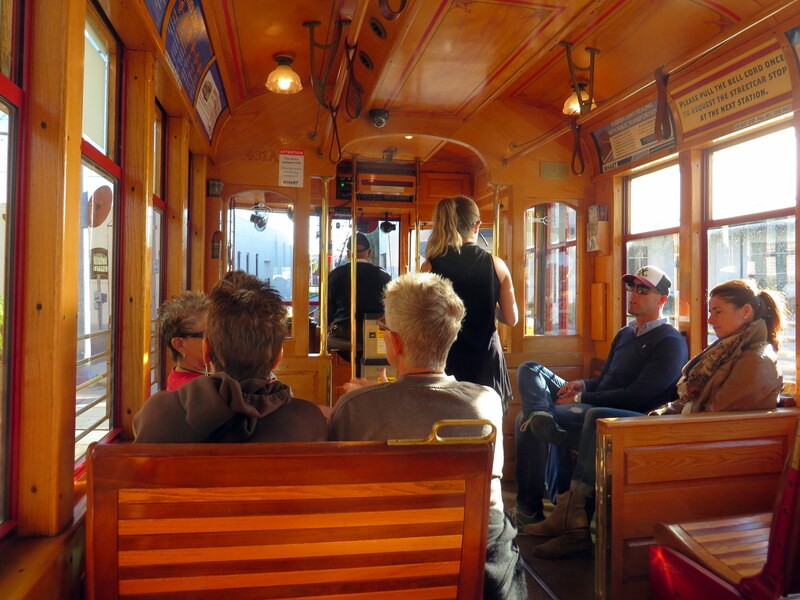 The streetcars run every 20 minutes, until about 9PM on weekdays and after midnight on Friday and Saturday nights. The line also passes the arena where the NHL’s Tampa Bay Lightning play; service is extended when there is a home game on weeknights. The TECO line is operated by the Hillsborough Area Regional Transit; fares are integrated with the rest of the local transit system. Like most American streetcar lines, TECO streetcar line is intended to boost development (of Tampa’s waterfront and around Ybor City) and caters to tourists; there were several European visitors on the ride into Downtown Tampa. But unfortunately, all but one streetcar in service that day were wrapped in full-body advertisements, obscuring the view out the windows. I detest transit ad-wraps; they devalue the transit agency’s branding; if they cover windows, they partially obscure the view from inside the vehicle. I feel that they disrespect paying passengers. But to wrap the signature transit fleet, especially one intended for visitors and occasional transit riders, seems wildly inappropriate. I’m a Torontonian, and I have loved streetcars since I was a small child. They have a certain “magic” that buses simply don’t have. Here in Toronto — not to mention in San Francisco, Philadelphia, Melbourne and many cities in Europe — streetcars/trams are an essential part of the transit network. Following Portland’s lead, the new modern streetcar lines being built across the United States (Washington, Milwaukee, and Kansas City are also building new streetcar lines) are looking to rail transit to promote mobility and economic growth in specific parts of those cities. Perhaps the small starter lines being built now will grow into large networks. 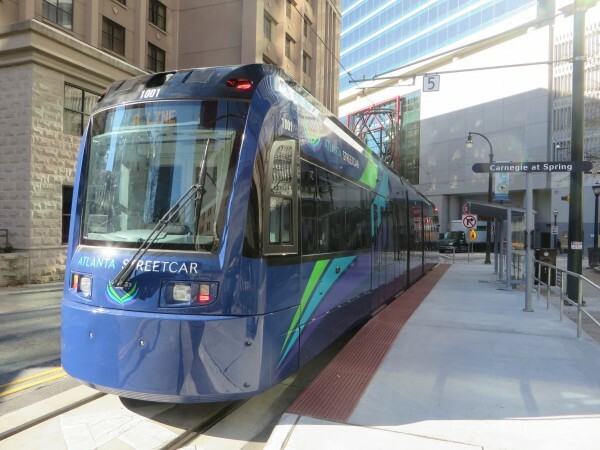 It’s likely that Atlanta’s streetcar system will grow and become more useful. Maybe Detroit’s M-1 streetcar will speed up the revitalization of the Woodward Avenue corridor and become a symbol of the Motor City’s turnaround (it does have the most utility, it seems, of the four routes I saw on this trip). I am happy to see federal money spent on transit and cities looking to building local transit projects, instead of the massive highway construction projects of the last century. But with those good feelings, I can’t help but feel a touch of skepticism as well. Doesn’t any other Mayor get or read memos from the former Mayor of Toronto, Rob Ford? Apparently not, thankfully. I was living in Tampa when its streetcar was put in. My wife used it to commute to her job. For was it is, I like it and tourists seem to quite like it. When it started, it used volunteer conductors to assist the drivers, and we were trained as part of the program (run by the former transit head from Melbourne, AUS I believe), but moved home before we could actually get on board. A minor correction…former Cincinnati streetcars no longer run in Toronto having been retired in the 1990s. The Cincinnati cars were PCCs.